I was about to give you a link to Clem’s blog going over some of the technical details for this, but I see you’re already present in that comments section! 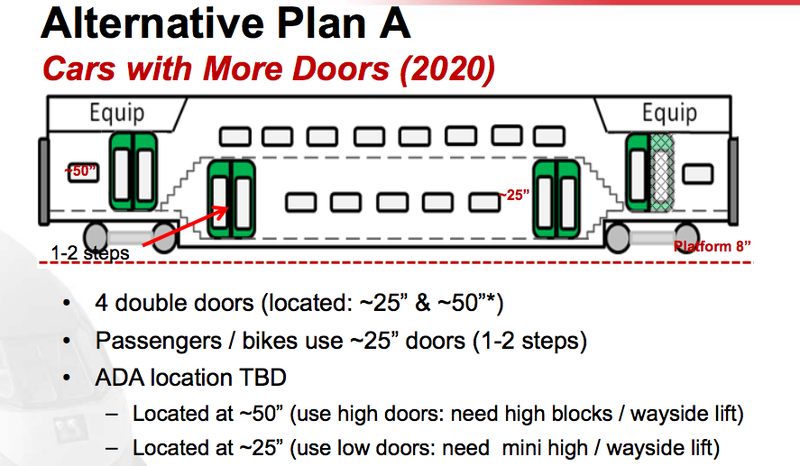 That half-width upper door at one end is definitely a concern, though – especially as transbay will be the busiest station in the system by far! Did they provide any rationale for it? The half-width door is schematic only, to symbolize that certain EMU manufacturers can’t put full-width doors there due to the space requirements for traction equipment (e.g. transformers or inverter packs). It has little to do with structural strength of the body shell. Thanks, that’s a relief. I think it’s pretty obvious that we need double-width doors everywhere. Hopefully the RFP will be written as such. Sorry, but the draft RFP only specifies only single 32′”-width doors. It is unlikely they will change that. Are you sure? That dimension is for end doors. Not side doors. You’re right, I did confuse the end door for a side door. However, the stairwell could also be affected by equipment modifications. Unless I missed it, I could not find any specification for minimum stairwell width.